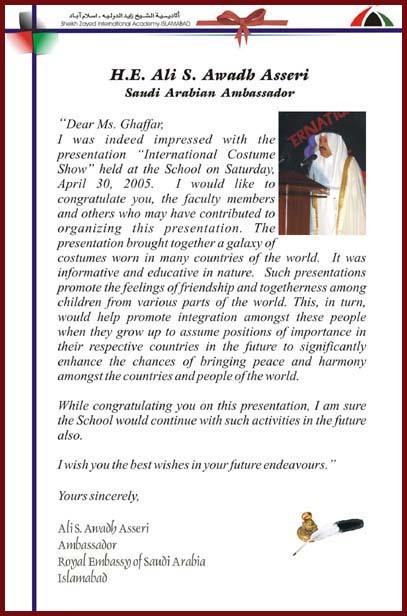 It gives me great pleasure to introduce myself as the Principal of our illustrious Academy, Sheikh Zayed International Academy-Islamabad, a one-of-a-kind academic institution that was established by H.H. Sheikh Zayed bin Sultan Al-Nahyan, the Late President of the U.A.E. His prime objective in building this institution was to provide quality education of an international standard in his beloved second home, Pakistan. I have been heading this academic institution since April 2003. Since the passing of His Highness, our Academy has been operated by H.H. Sheikh Mansoor bin Zayed bin Sultan Al Nahyan, the Minister of Presidential Affairs, the U.A.E. and its running is overseen by the Board of Trustees of SZIA which is headed by H.E. Sultan Dahi Al Hmeiri, Chairman of the Board. Sheikh Zayed International Academy-Islamabad opened its doors to a population of 65 students on September 1, 2003. Since then, our Academy has grown by leaps and bounds in all respects. At present, we have aproximately 300 students of thirty different nationalities who have given life to the dream that His Highness Sheikh Zayed held many years ago. Our greatest strength, by far, is the ‘internationalism’ of our student body, curricula and our teaching faculty and administrative staff. Together, they make Sheikh Zayed International Academy-Islamabad a unique force in education, one that holds recognition and acclaim around the world from our Academy’s distinction in 2004 of being the first and only Cambridge University/London Exdexcel-accredited ‘A’ Category Examinations Centre in Pakistan through to the repeated successes that our students have achieved at the numerous national and international competitions they have been entering since the opening of the Academy. Internally, we are also proud of the many services and facilities that make ours a dynamic, technologically up-to-date academic institution that is conducive to optimum learning by all students. Regardless of their scholastic acumen and abilities, the students at our Academy receive the professional attention they need as we make it a point to cater to individual needs, student by student. 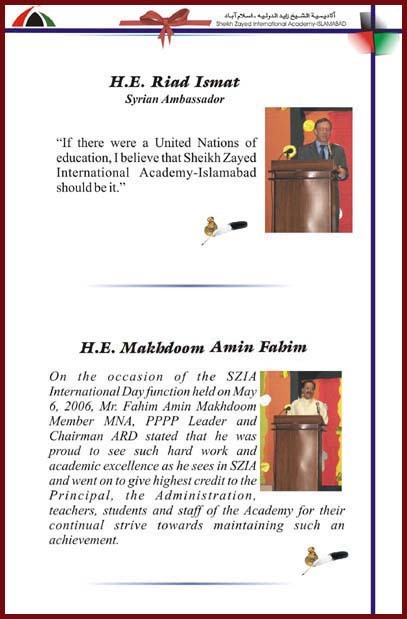 In addition, the Administration at Sheikh Zayed International Academy-Islamabad is keen to continually reinforce the ‘home-school connection’ as it recognizes the value of making education and character development the cornerstone between educators and parents for the ultimate benefit of our students, their children, respectively. As I reflect on our Academy’s growth thus far, I marvel as I remember where we were and, as I realize where we are now, I can only express my sincere gratitude to H.H. Sheikh Mansoor and the Board of Trustees for their unwavering guidance and support, to our teaching faculty members for their dedication, to our parents for their continued cooperation and, to our vibrant students, who make every day at Sheikh Zayed International Academy-Islamabad a joyful, challenging, rewarding experience! I welcome you to journey with us now as you view this website and enter a world of education where only the sky is the limit–as you visit Sheikh Zayed International Academy-Islamabad! Established in 2003, Sheikh Zayed International Academy-Islamabad is a privately-owned co-educational, international day school which offers premium-quality education of an international standard to students from Playgroup to Grade 12 level and, hence, enjoys the reputation of being one of the most prestigious academic institutions in Pakistan. Almost since the inception of this Academy, we have enrollment from all over the world. Our student body reflects today twenty two different nationalities. Why do Parents Choose SZIA? 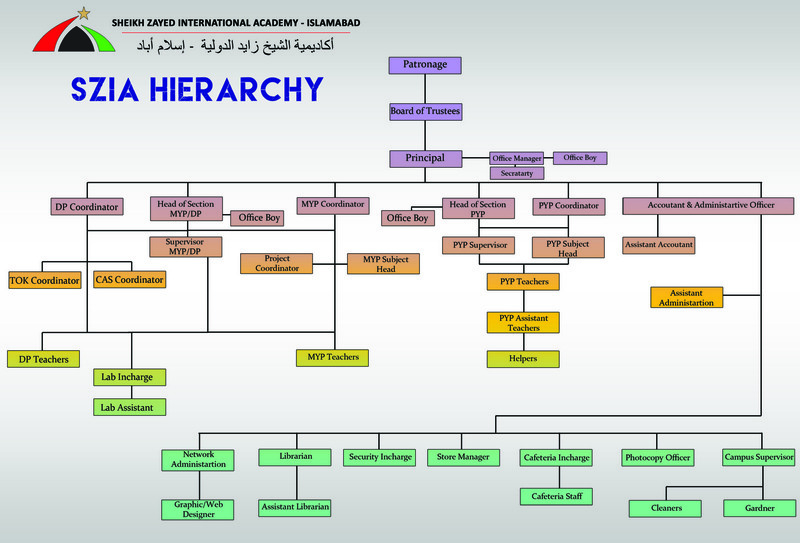 Sheikh Zayed International Academy-Islamabad is truly international in its student body, teaching faculty and curricula. Students from twenty two different nations today are being prepared to cope with the problems and challenges of a rapidly-changing world. We have the students of foreign-national Ambassadors and Diplomats, the students of high-ranking UN Staff Members and those students of prominent Pakistani nationals attending our institution. As such our student body is represented by the nations of the Algeria, Afghanistan, Australia, Canada, Ethiopia, England, Egypt, Germany, Ireland, Japan, Kuwait, Lebanon, Libya, Oman, Qatar, Saudi Arabia, Switzerland, Sudan, Syria, the U.A.E. and the U.S.A. Teachers and Administrative staff members from various countries are working in the caring, friendly and disciplined atmosphere found in the Academy. These include nationals from the Canada, Lebanon, the U.K., Jordan, France, Sudan, Egypt, the U.S.A., Russia, Uzbekistan and Pakistan. The school community has a deep commitment to multi-cultural appreciation and cooperation. This diversity is one of the most valuable aspects of the Academy. With a consistent focus on setting a solid academic foundation, SZIA’s comprehensive and challenging curricula prepare students for success in their future academic career by SZIA’s incorporation of Cambridge International into the curricula of Grade 1 to Grade 12, namely the International Primary Programme for Grades 1-5, Cambridge Checkpoint for Grades 6,7 & 8, IGCSE for Grades 9 & 10 and SZIA has been authorized as International Baccalaureate Diploma School for the year 2017 onward. Hence,Grade 11 students will enroll in the IB Diploma programme. It is an externally- tested two year programme culminating in an IB Diploma. There is a great variety of subjects offered, catering to a wide range of scholastic aptitudes. We also have departments of ESL (English as a Second Language) and Core (easy) Math for students who require it. Upon gaining sufficient academic proficiency through these departments, the students are able to join the mainstream of the extensive studies in these subjects. The teacher-to-student ratio is relatively very high: 1:12 in the Junior Section and 1:6 in the Senior Section. We try to keep a maximum of twenty students in each class in order to effectively address the students’ individual differences and to give students the opportunity for optimum growth, according to their particular gifts and talents. Internally, the Academy is very dynamic. We believe that extra-curricular activities form an integral part of the learning and development of all students as these kinds of activities complement the formal curriculum. Hence many colorful activities, functions and ceremonies are held in which all of the students participate in both the performance and presentation segments. In addition, the students enjoy Club Activities that are run in the periods designated for each grade level. Rounding out the extra-curricular side of school life at SZIA are the yearly field trips to the U.A.E. and various historical and geographical places of interest in Pakistan. Externally, the Academy is very prolific in its participation in and success achieved at the multitude of national and international contests and competitions in which it enters throughout the academic year. These are competitions such as Kangaroo International Mathematics Contest, the WSPA (World Society for the Protection of Animals) Quiz/ Speech Competition, the Alliance Francaise French Singing Competition, the U.K. Young Learners Art Competition, the WWF Nature Carnival, the Wetlands Gala Festival Competition and the DAWN in Education Annual Spelling Bee. We are very proud of the many 1st and 2nd Prize awards that our students have earned at these competitions and contests. The magnificence of the SZIA campus structure itself, as well as the many excellent facilities available for the students, makes Sheikh Zayed International Academy-Islamabad an exemplary institution for academic and social learning. Finally, in addition to the scholastic classroom lessons, we have in place a set of concrete rules and regulations designed to enhance our students’ respect for both people and property. This establishes an internal society at the Academy which is safe and tolerant, priming the students for optimal learning as they interact with each other, with their teachers and with the material and structural resources and facilities that are provided for them. The IB programs challenge students to excel in their studies, as they encourage both personal and academic achievements. SZIA was awarded candidacy in all three IB Educational programs in February 2015 – Diploma program, MYP ,PYP. 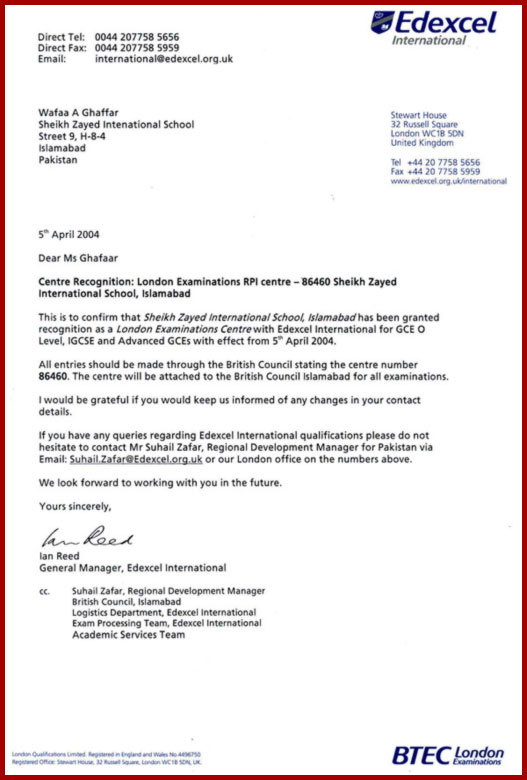 SZIA was the only school in Pakistan to opt for all three programs at one time. In a short span of time, a one year of hard work, the Diploma program was authorized by IB, thus MYP and PYP are effectively putting in the same efforts to meet the challenges for their own authorization. The IB Diploma Program will empower the students to meet the challenges of the twenty first century, as it aims to develop in them significant breadth and depth of knowledge which will ensure that students flourish physically, intellectually, emotionally, socially and ethically. The MYP encourages students to become creative, critical, and reflective thinkers and is designed to prepare students for the DP. Additionally, the MYP emphasizes intellectual challenge, encouraging students to make connections between their studies in traditional subjects and the real world. In its own way, the MYP fosters the development of skills for communication, intercultural understanding, and global engagement- essential qualities for young learners to become global leaders. 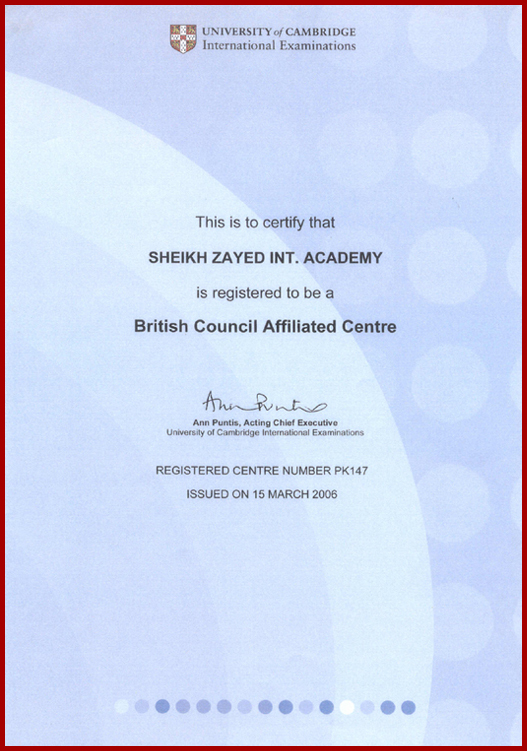 Sheikh Zayed International academy is an IB PYP candidate school. The IB Primary Years Programme (PYP) is the curriculum framework designed for students ages three to twelve (Preschool to Grade 5). It aims to develop the intellectual, psychological and physical potential of each child in a thought provoking environment. A propulsive dynamic behind the PYP is the philosophy of international mindedness. It strives to cultivate young minds with integrity, empathy and compassion empowering them to metamorphosis into global citizens, who are galvanized to bring positive changes in this world. The students become influential communicators and principled yet balanced and open-minded inquirers who are risk takers and reflective thinkers which makes them all the more caring. The mission of Sheikh Zayed International Academy-Islamabad is to help our students to become positive-thinking citizens who use knowledge and experience to develop their countries and to be active citizens in making a better future world. To this end, our main aim is to help our students grow as responsible, knowledgeable, thinking adults who retain their culture and traditions and, at the same time, respect all other nations, races and religions. Education is a step towards the future. We aim for a healthy environment that positively affects our students’ scheme of thinking and interaction. 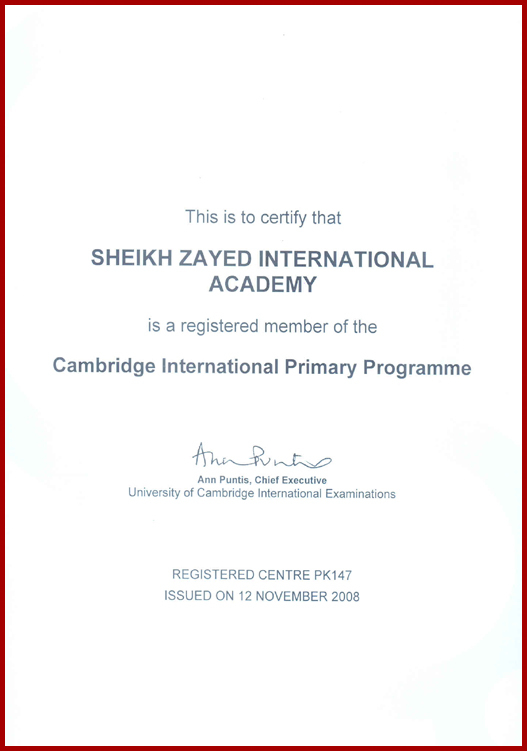 Sheikh Zayed International Academy-Islamabad is affiliated with both Cambridge International University and London Edexcel, the two premiere boards of education in the United Kingdom, after receiving the dual accreditation in March 2004. At that time, our Academy was the first and only academic institution in Pakistan that had been designated as an ‘A’-Category Examinations Center. Since then, our scope of curricula has been extended as that of Cambridge International has been incorporated at virtually every grade level as follows: Grades 1 to 5 International Primary Programme, Grades 6, 7 and 8 Cambridge International Checkpoint, Grades 9 and 10 IGCSE and for Grades 11 and 12 A-Level and AS Level. Due to this unsurpassed accreditation and this solid, curricular foundation, every graduate of Sheikh Zayed International Academy-Islamabad has the opportunity to enroll in any college or university of her/his choice,in any country and under any academic system in the world! Thus far, the results secured by our students who have written their Cambridge International Examinations have been very commendable: in 2006: 100% Pass, 44% A*s and A’s/ in 2007: 100% Pass, 61% A*s and A’s/ June/November 2008: 100% A’s in A-Level, 86% A’s in AS Level, 65% A’s and B’s in the IGCSE.